One wonders why someone would write and record progressive rock music that deserved close attention only to be used as background music. Ah, but those are the soundtracks that get noticed and take on a life of their own. 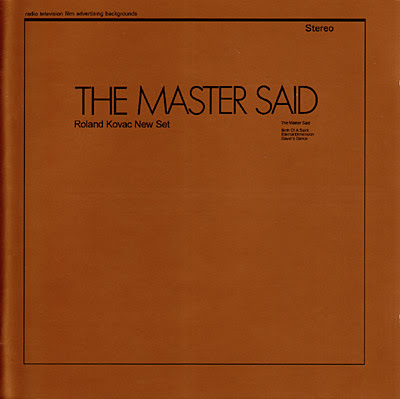 Such is the case with Roland Kovac New Set’s The Master Said But by background, I don’t mean wallpaper, as the music has been used in film scores, though I have no specific information on which films they were. Kovac latter composed some of the music used in the Breathless, starring Richard Gere, and Pulp Fiction. The New Set were Kovac on keyboards, Siegfried "Sigi" Schwab on guitar, Charly Antolini on drums and Franz Löffler on bass, and The Master Said was recorded in 1971. As you might expect, this being a Garden Of Delights release, there are informative liner notes and pictures. They have also preserved the original look of the LPs with the plain bronze jacket and black lettering - these were releases in a larger series of recordings by the label, Selected Sound. The album begins with the 17-plus minute title track, which itself is broken down in to 25 parts. As the liner notes explain, the breakdown between parts has more to do with instrumentation or feel rather than concept. With the intention of it being used for background music, you might think of those 25 segments more as cues. Löffler’s throaty bass leads things off assertively (though the tiny, tiny original liner notes say "electro-piano") to which are added one by one, crisp, taut drum and percussion, then jazzy, solid guitar playing and finally organ. This is progressive rock by way of jazz, but is certainly very much in tune with the progressive rock of the time. While sonically there is no similarity, I am going to name check ELP because I hear a very similar dynamic - though Kovac doesn’t abuse his keys the way Emerson did - and had no need to. But even saying ELP is misleading, because you might think of Wakeman more (at times) with Kovac’s playing - assigning no influence in that. A moody guitar and bass duet comes at the 10 minute mark, leading into a drum solo from Antolini, each highlighting these obviously skilled musicians -- Kovac, Schwab and Antolini had already made a name for themselves when they got together to record this music. Löffler, who passed away in the 70s, was the lesser known member of this quartet, but had appeared on numerous albums leading up to this point. You might think, in the hands of average musicians, that a 17-plus minute piece would get boring, dull or repetitive ...Not here, as it holds interest throughout. "Birth Of A Saint" sounds more like a film score music with bloopy sonic effects suggesting a 70s horror film -- not in the way Goblin does of the darker Italian cinema, but this, of a more peculiar type of film. There is even a country-western section with a twangy guitar offset against gothic or church organ like keyboard phrases. There is even a point where you might call it avant-fusion -- the cues call it "chaotic, very quick vibrations." Yes, that works, too. If you are in any way imaginative, and I assume you are (you like progressive music after all), you can almost imagine the "movie" this would provide the score to, but I’m sure the details will differ between you and I. " Two shorter pieces conclude the album, the organ centric "Eternal Dimension" -- which recalls, at least for me, classic Procol Harem. It is a mellow, reverent piece that could equally be played in a church for Sunday services - and perhaps the generation of the title. But, what I’m hearing is something similar to "Whiter Shade Of Pale" - of course, what else do you think of when PH gets mentioned? A beautiful and somber piece of music. "David’s Dance" (composed by Pietro Leguani, one of Kovac‘s pseudonyms) begins with an organ riff that seems like a take on something by Beethoven ("Ode To Joy," I think). It becomes rather quickly a gentle piece with flute like keys -- that is, high toned and airy like a flute -- a musing bass line, and gently strummed guitar. It’s wonderful that Garden Of Delights has been able to bring this wonderful music to the ears of those who would most appreciate it in its fullness - no moving pictures or dialog to get in the way, just good -- very good -- jazz inflected (Schwab and Antolini are jazz artists) progressive rock. Notes: Originally released in 1971 on 'Selected Sound' (Stereo 9028), a German label for library music. The original masters of The Master Said are lost. This reissue is restored from a pristine vinyl copy.